Review : Dermal Collagen Essence Sheet Masks (2 variants)! Recently Skin18 sent me two Dermal Collagen Essence sheet masks, as part of their ongoing Reviewer Programme (which you can join too, even if you are a newbie blogger (Minimum requirement : 500 followers), by clicking here). The ones I got were a) Pearl & b) Royal Jelly. These sheet type essence masks offer your skin direct nutrition & is of high quality. They are easy to use and fuss free. Both of these give a snug fit on the face. The masks are brimming with essence. I found most essence on the mask itself and next to nil dripped inside the pack in the case of the Royal Jelly mask. However, the Pearl one had a more runny type of essence and there was plenty inside the pack, which I took in my hand and massaged into my face. Both masks have a light, pleasant scent and is cool to touch and non oily. It says here on the pack that it should be applied on cleansed skin. I left it on for 20 mins. The Pearl one felt brightening and moisturising while the Royal Jelly one left my skin feeling hydrated and nourished. I do recommend you try these masks. The only problem I found with it is that both has parabens in them. Price : $1.40 (Approx AED 5.14) for each of these masks. They are definitely budget friendly. Have your ‘fine’ expression lines begun to look more like trenches of late? Have you noticed a loss of volume in your cheekbones and a loss of plumpness in your lips? If the answer is a resounding ‘yes’, and you’re looking to stave off these telling signs of aging, we have just the solution you were looking for: Fillerina! Part of a new generation of non-invasive, temporary cosmetic solutions, Fillerina is a topical filler treatment that can increase and replenish lips and cheekbones volume, as well as fill your wrinkles and lines –all to make your face look youthful and refreshed. The results are instant and gratifying. What’s more, it’s a simple 2-step treatment that you can administer at home, for a duration of 14 days. Step 1: The Fillerina Gel. Start your treatment with the gel which you can apply by using a precision applicator (fitted with a truncated metal tip), provided in the kit. Make sure to cover the areas where you have deeper wrinkles and expression lines, along with the areas that require greater volume, such as cheekbones and lips. The Fillerina gel benefits from a proprietary method of filling the cutaneous tissues through a special use of hyaluronic acid, which plays a key role in binding large quantities of water molecules in the skin. The formulation of the Fillerina gel combines 6 different types of conveyed hyaluronic acids, which have individual molecular weight and structure, and, together, deliver a diversified action in the various cutaneous layers, to facilitate the filling in and plumping up of skin tissue. The active component, Matrifull, acts over time on the skin matrix, promoting the reconstruction of the natural filling substances such as collagen I and III, and fibronectin, for a visible plumping effect. Step 2: The Nourishing Film. To be applied after the Gel, this is a highly effective blend of optimum hydrating and revitalising ingredients that ensures the skin benefits from maximum comfort and nutrition, all the way through the day and night. It also leaves the skin looking bright and silky to touch. Over the course of 14 days (the duration of one treatment), Fillerina can turn back the clock: it can enhance and restore your facial features, smooths out lines and soften wrinkles. But what you want from a filler treatment is not just filling and plumping. It’s delivering aesthetically pleasing results in a subtle manner, so you can look more youthful in a relaxed, natural way. And that’s precisely what Fillerina delivers! The treatment can be repeated every 3 to 4 months as required. Fillerina is the result of 5 years of research at Labo Cosprophar Suisse, renowned for its expertise, high standards of clinical safety and ability to bring best-in-class products to the cosmetic industry and consumers. 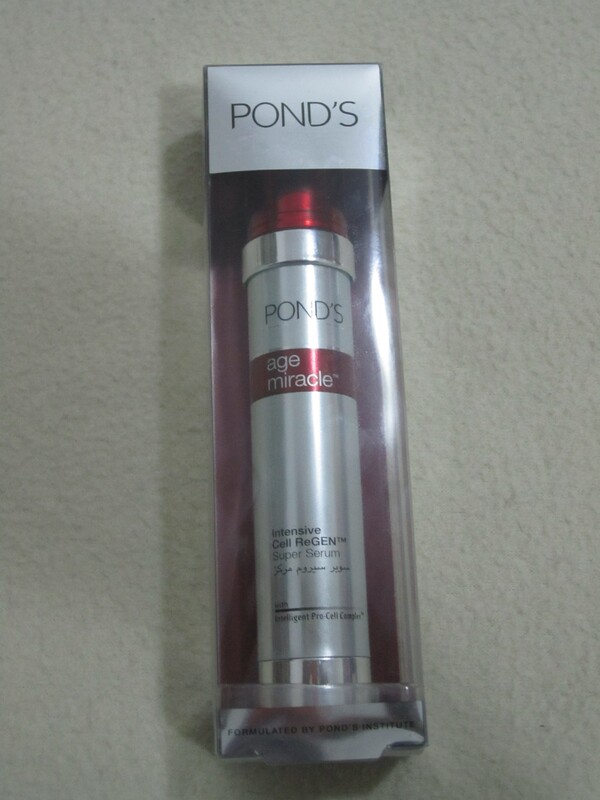 Fillerina is available at leading pharmacies across the UAE from February 2015 and is priced from AED 499.
Review: Ponds Age Miracle products! This is the first time I have come across an eye cream which targets specific problem areas around the eyes. That means, a cream each for upper eyes and lower eyes!. 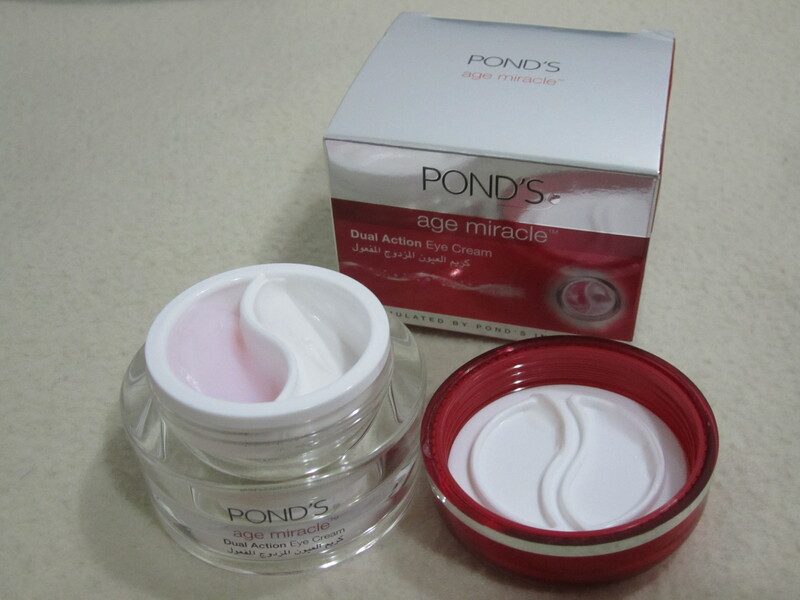 The pink cream, which is for upper eyes, is enriched with cell boosting Collagen, which helps reduce the appearance of fine lines, wrinkles and crow’s feet for a smooth and lifted look. The white cream, which is for under eyes, is powered by CLA (Conjugated Linoleic Acid), which helps stimulate skin to reduce puffiness and dark circles, thus instantly brightening up tired looking eyes. The packaging is really pretty. It’s a glass container with a lid that separates both the creams. It contains 20 ml, which will last you a long while because a little goes a long way when it comes to eye creams. Within 2 weeks of it’s usage I noticed significant difference with my dark circles. It really works. I feel like my upper eye area is looking better too. It’s consistency is perfect enough that you can easily pat it around the eyes and it gets absorbed super fast. The white cream is slightly thicker than the pink one, but still easy to work with. I say this product really lives up to it’s claims and so, this is one eye cream you got to be checking out right now. Price : AED 44.95 for 20ml. Available at all local supermarkets. The packaging of this day cream is elaborate and nice. It’s a gorgeous glass container which is packed in a square plastic covering. The red lid is pretty and the container has a very unique shape. When you open it, there is a white lid (which I never discard in any creams, because I love how hygienic it is when the product doesn’t get smeared all over the main lid). It comes with a leaflet which shows all the products in this range (this comes along with the eye cream too). I love the fact that this day cream contains SPF. This particular cream is for normal/dry skin. It helps renew skin faster and intelligently targets fine lines, wrinkles and age spots, resulting in exceptionally smooth skin. The consistency is velvety and creamy. It has a pearlescent look. Being creamy, it gets absorbed fast. You need just the slightest amount to cover your entire face. It is pinkish white, with the slightest bit of shimmer in there, which leaves skin brightened up and looking youthful. It smells very pleasant and feels extremely light on the skin. The result is skin that is velvety soft to touch. One thing I really dislike about it, is that it leaves a whitish tint on the skin. It shows very well on me because I have a dark skin tone. It might be because of the SPF content but even if that’s the reason, for SPF 15, it’s too much of a tint. I have got to say though that when my mom uses it (she has been using this range for some time now), the whitish tint doesn’t show really well because she has a fairer skin tone. 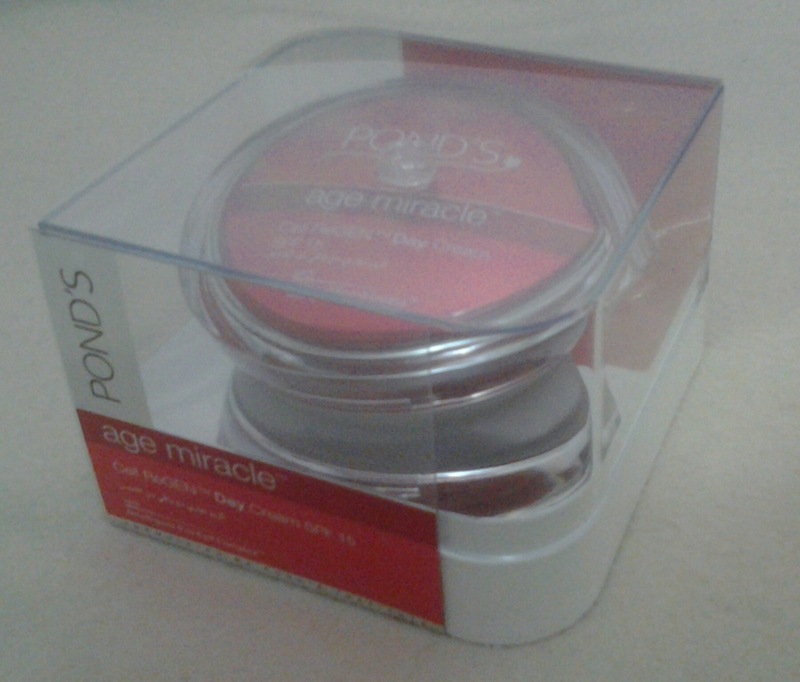 Overall, I recommend this cream to all because it gives such a soft skin tone. But I personally won’t use it again, because even though it has it’s pros, the whitish tint is a bit too much for me to work with. Price: AED 52 for 50 gms. Available at all local supermarkets. Serums are crucial to the skincare regimen because of it’s power to penetrate and go deeper into the skin cells. I just love serums. 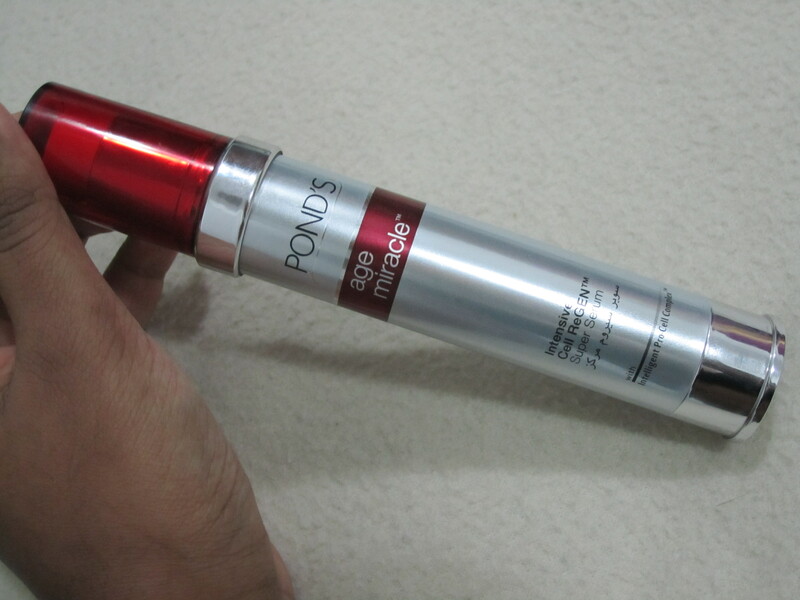 This super serum from Ponds is intensive and highly potent, containing 20 times the concentration of CLA when compared to the day cream (reviewed above). It dramatically boosts skin’s capacity for young cell generation. It comes in a tall, metal like container, fitted with a pump. It contains 30ml. 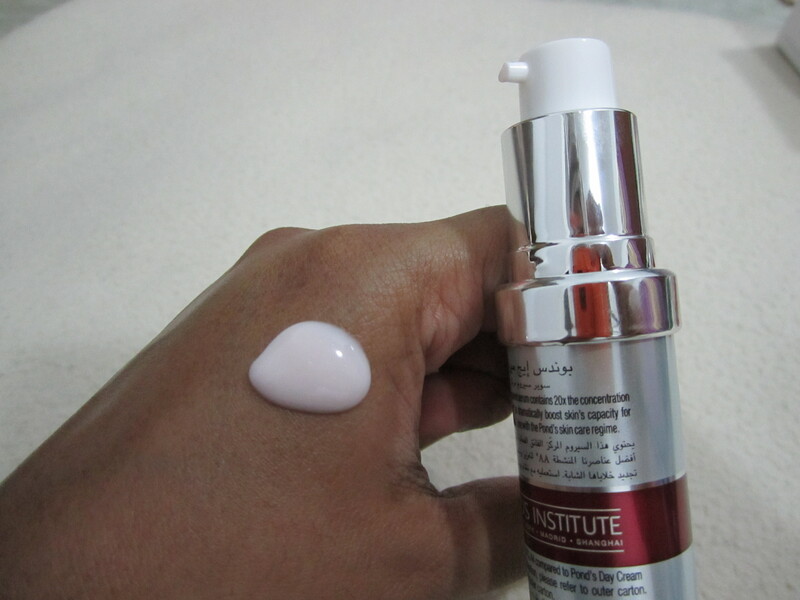 The serum has a pinkish hue and is absorbed by the skin extremely fast. I used three pumps of it on my face and two on my neck, both morning and night. Dispensing the product is convenient and hygienic with the help of the pump. It has a very pleasant and soft smell that lingers on. This product lasts a month. I kind of expected it to last me a lot lesser time but 30 ml for a month is a good deal. The result from using this serum is instant youthful looking and rejuvenated skin. I am not kidding you when I say ‘instant’. It really does get to work as soon as you apply it. My skin feels extremely hydrated and soft. I can’t tell you enough how much I love this serum. This is a definite buy for me in all the years to come. Price: AED 49.50 for 30ml. Available at all local supermarkets. 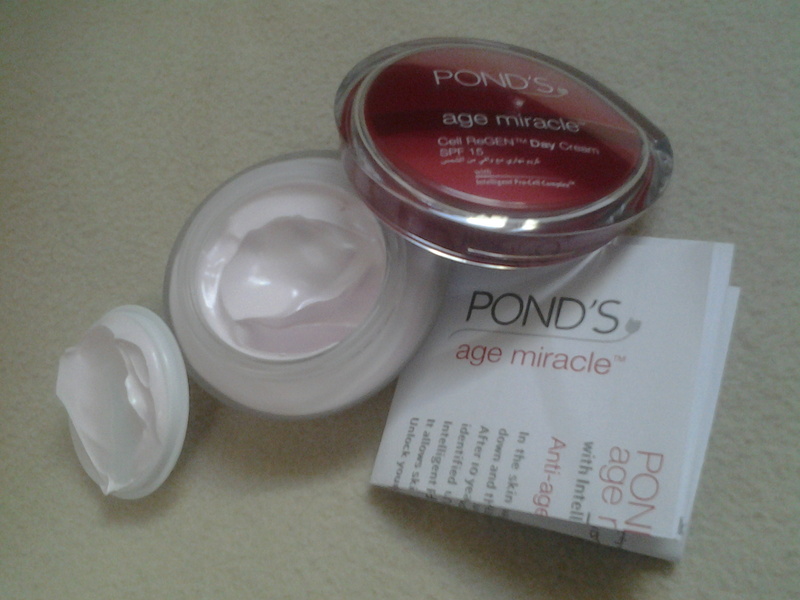 I highly recommend you try Ponds Age Miracle skincare products. Your skin will definitely thank you!. 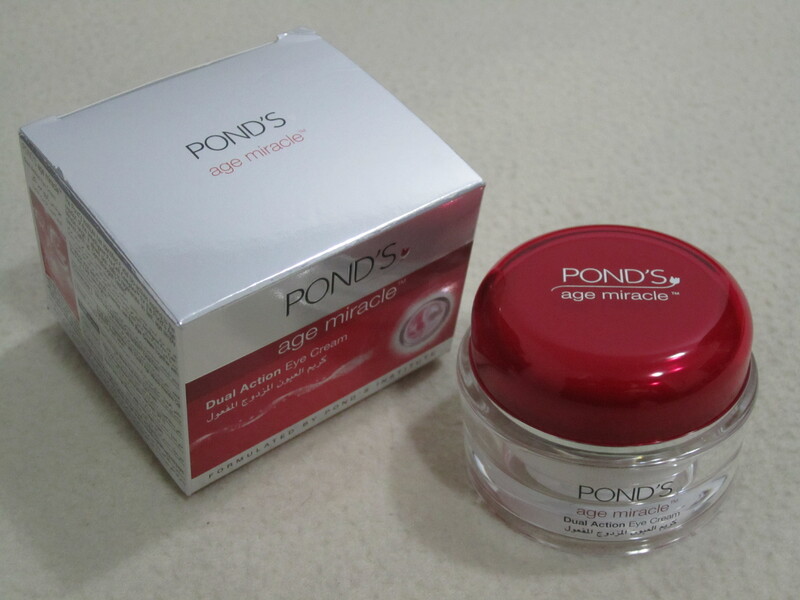 Have you ever tried Ponds?. Let me know in the comments below. Note: I was given these three products for review purpose. All opinions are 100% my own.